September 6 2007, the 52nd Venice Biennale, at the Thetis New Arsenal, will be the site of a full day of events organized by the international network Cultura21. Lectures, debates, performances, videos and a workshop, entitled “the Cultural Dimension of Sustainability – Towards an Ecology of Culture,” will commemorate Beuys’ “Free International University” at Documenta 6, 30 years ago. The “100 Days of Conference” re- opens, with the theme of “The Defense of Nature”. September 5, the South-African artist James Reed (Social Sculpture Research Unit at Oxford Brookes University) and a team of volunteers will perform the social sculpture intervention “Agents of Change” outdoors, around the canals in the center of Venice. This will be a Prequel event to the main program. 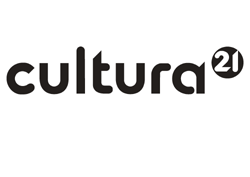 The Cultura21 network gathers scientists, artists, activists, intellectuals and other cultural actors promoting cultures of sustainability. Its activities range from local initiatives to international events and exchanges. The September 6th program at the Thetis New Arsenal will include contributions by the renowned artists Isabella Bordoni (Progetto per le Arti, Rimini); Aviva Rahmani (Ghost Nets, USA); Shelley Sacks (Social Sculpture Research Unit at Oxford Brookes University, UK); Insa Winkler (Social Land Art Project, Germany); the activists and researchers Davide Brocchi (Institut Cultura21, Germany); Francesca Cozzolino (EHESS, France); Hans Dieleman (Universidad Autonoma Metropolitana, Mexico); Sacha Kagan (Leuphana Universitaet Lueneburg, Germany); Steffen Keulig (Freunde der Naturvoelker, Germany); Oleg Koefoed (Gravitations Centre for Action Philosophy, Denmark); Sabine Kuegler (bestseller writer, Germany); Michele Marziani (journalist and writer, Milano); Ilaria Riccioni (Free University of Bolzano) and Benny Wenda (chairman of the Koteka Tribal Assembly and chair of the Free West Papua Campaign UK). James Reed’s intervention (Sept. 5th) directly engages the public with the issues of future sea level rise and climate change. At Thetis (Sept 6th), the first part of the morning will start with an introduction to the ‘Cultural Dimension of Sustainability’ and will be dedicated to a cultural perspective on the world, with a video and debate about West Papua – the forgotten war in Asia (Keulig, Kuegler, Wenda) and a video and debate about Unsustainability in European university reforms (Kagan). The second part of the morning will deal with movements and migrations, with Bordoni’s installation “Digital Migration/Fraternité: a fragment” and Marziani’s “Journey on the Po River”. In the afternoon, we will explore Culture as Change Factor, with lectures on Social Engagement and Creativity (Riccioni) and on the Field of Social Sculpture (Sacks). The day will include videos and debates about The Acorn Pig Project (Winkler); Virtuality as Trigger Point at a Global Tipping Point (Rahmani) and the workshop/performance “Flowers of Sustainability” (Dieleman/Koefoed/Winkler). The Prequel event on September 5th will take place outdoors in the center of Venice. Access will be free. Events will also be FREE at the Thetis New Arsenal!